5 How to choose tea? types of tea, first of all, varying degrees of oxidation or fermentation of raw materials - the leaves of the tea bush. Thus tea leaf receives certain quality by reaction with oxygen. Exists 4 main types of tea: green, yellow (white), Red and black. The production technology is, that the tea leaves are subjected to a very weak fermentation, often leaves only a pre-fixed with a pair of, that maximizes the retention of all its nutrients. Infusion Tea has a color from light green to deep yellow, even brown, rich variety of distinctive flavor, flavor and astringency. Loose (baikhovi) Green teas are divided mainly into leaf and scrap. Chinese varieties differ every possible torsion leaf, which is in the form of intricate pellets, Caper, peas, needles, of different sizes, is tea, derived from the flattened leaves, often flavored with jasmine. Unusual form of green Chinese tea varieties have created poetic names, eg: "Gunpowder", "Dragon Well", "Fleecy mountain peaks of Huangshan," etc.. Teas are directly linked also to the methods of processing raw materials, place and time of collection of leaves. Japanese green teas are different from the Chinese in their properties and methods for welding. Known and popular powdered matcha tea (the match), used in the old Japanese tea ceremony, hekuro, and u. 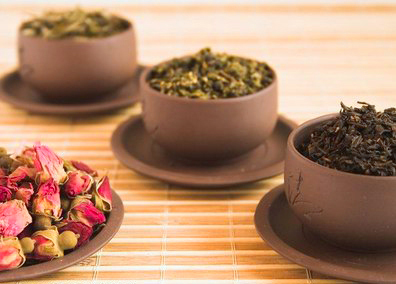 Great choice of varieties of green tea is usually in specialty stores or tea salons, in a broad sell it not so diverse. Yellow tea distinctive feedstock selection and pre-process light yellowing before drying. These teas are quite rare, grades their bit. These teas are very valuable, in the past we were not allowed to be exported from China, even under pain of death. Enjoy bright toning effect, thin, fragrant aroma and taste. White tea - a very useful and easy, soft selective elite tea flushes, are collected only in the early spring, subjected to withering and drying. Varieties of it too little, You can also try, eg, grade Bai Hao Yin Zhen. It can be called a relative of black tea. It occupies a transitional position between green and black teas, It has a pleasant aroma and taste, orangish color infusion. Common name - "oolong", Oolong. Oxidation leaves moderate. Undergoes the most severe oxidation, It has intensively colored infusion, sour taste, very fragrant. Teas are divided into Loose (baikhovi), pressed and extracted. Loose teas were called baikhovi because the ancient Chinese name "Bai Hoa", which means "white cilium", secure for the young tea buds, hoary. Previously called baikhovi only elite teas from young unopened kidney, and now, more of them in a variety of tea, so it is higher on the grade, so tasty and fragrant. To loose one include granulated and packaged teas. in form Loose teas are leafy (big) and broken, sharps and baby (tea dust). There are three main types of tea: high-grade, medium and low-grade. For the most elite and expensive varieties tea is characterized by a high content of artificial nails - unblown kidneys tea bush and most of his young, apical leaves and shoots. Tea from one of the kidneys found in a broad sell hard, a distributed mixture of tea leaves and tipsov. For high-grade class includes leaf tea and. Medium teas is produced from the leaves below grade, polygonal. He will not have such a delicate aroma and taste, as the higher-grade teas, Although the fortress difference may not be as noticeable. low-grade varieties made of low-quality tea leaves, rougher and shorter leaves, leaf tea waste when cutting and sorting, tea crumbs, dust. Respectively, all this affects the taste, and aromatics. On the quality of tea and its grade is also affected by various factors: locus, weather, the time of collection and quality, correct sorting, production technology, storage, transportation. 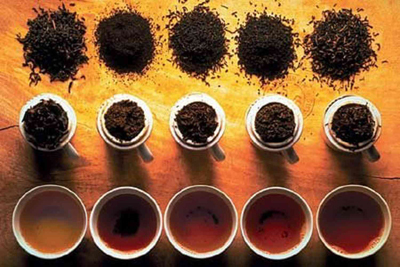 In accordance with a combination of these indicators, tea is assigned its own number. tea room It means the cost of a kilogram of this variety in units. therefore, the higher the number, the better the quality, thinner flavor, more complex and richer taste. Often additionally flavored teas using dried flowers, plants, essential oils, add pieces of dried fruits and berries (cherry, strawberry, pineapple, blackberry et al.). Popular teas with bergamot, Jasmine, mint, lemon aroma, orange, roses. Added to tea and artificial flavors to chocolate smell, cream, etc.. In Japan, like tea with roasted rice, India - with lotus flowers, pawn. To assess a particular brand of tea, it should be, certainly, try! note, it is better to buy tea at reliable suppliers, as fakes his lot, especially expensive varieties. Be sure to look at the expiration date, the presence on the packs brands, which often puts firms and controlling the quality of institutions. Check the uniformity of the raw materials, its humidity, tea leaves rubbed his fingers, can be a few tea leaves to taste. The good tea will not attend the trash, fragments of twigs, chips and tea dust. Many means the color of tea leaves, for good quality tea, he brilliantly, overflow, Many teas also have their characteristic color shade. Read the Internet for information about the features of one sort or another, when you buy, consult with experts on the forums. tea scent can also say a lot, good tea will not have a burning smell, metal, moisture etc..
To find and select your tea, buy a small number of selected varieties, because in the specialized tea shops have the opportunity. try, compare the types and varieties of tea, and gradually draw conclusions about the compliance of some specific types of tea exactly to your taste.